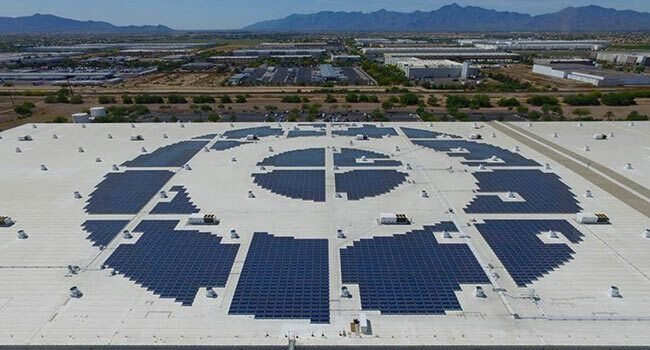 Target installed the retailer’s largest solar rooftop array at its Phoenix distribution center, in a partnership with Chicago-based solar installer SoCore, as part of the firm’s efforts to increase its use of solar power for its energy needs. The recently completed solar array will generate just under 3,000 megawatt hours of energy each year, providing 30 percent of the center’s yearly energy use. The new array is one of the 13 solar projects Target completed in Arizona recently, totaling 7 MWh. The retailer plans to install 10 more solar rooftops in Arizona this year. The array is the third largest solar project in the Salt River Project (SRP) territory. It joins other Target solar sites in Tucson (4 stores), Surprise, Peoria, Mesa, Sierra Vista, Glendale (2 stores) and Phoenix (2 sites). The Arizona solar installations are part of Target’s goal to have 500 stores with rooftop solar panels by 2020, with over 350 installed projects completed already. Target is increasingly meeting a larger portion of its energy needs with solar power. In fact, Target installed more megawatts of rooftop solar in 2016 than any other U.S. retailer, and in 2016, the company was named the No. 1 U.S. Corporate Solar Installer by Solar Energy Industries Association. Target has many efforts for it to go green with its energy usage, investing in wind energy partnerships.